Keeping on the theme of Tonic Studios Beautiful Blooms - USA | UK, I am sharing more cards. Today is the turn for the Apple Blossom - USA | UK. Nuvo Crystal Drops Ebony Black - USA | UK. 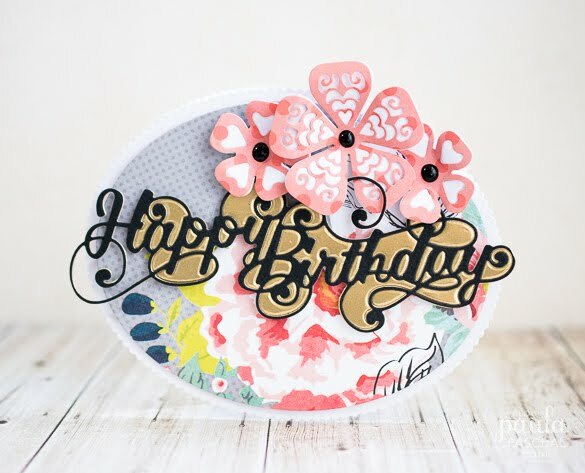 The floral paper is from Heidi Swap and coral is from Simple Stories. To make the base card I die cut two scallop ovals, and on just one I scored it on the left edge at about 2cm or just under 1". Then I glued that tab to the other piece to create a single folded card that has an edge all around. using the same layering set I die cut a smaller straight edge oval and attached it to the card. For the Birthday Swirl - USA | UK - sentiment, I die cut it using black card and removed all the excess bits. Then I die cut it using thick gold matt mirri card, as it is extra thick all the bits inside didn't fall away so while still on the die I used thin washi tape to keep them in place. After, I glued the black sentiment over the top. 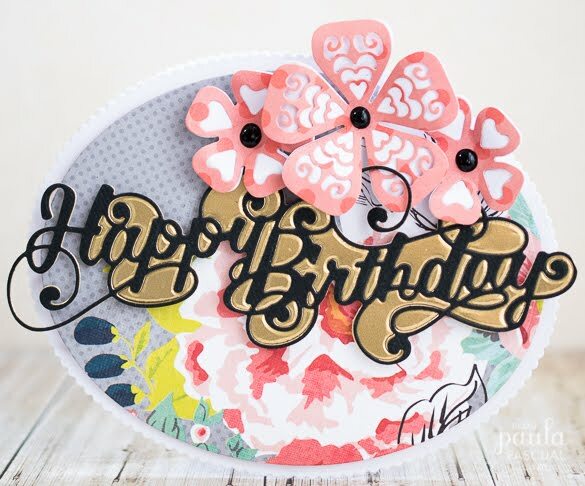 I die cut the flowers using the Apple Blossom - USA | UK - using just the outer die with white card and then the outer and inner aperture creating die using the coral paper. That is the beauty of verso dies, you can do so much with them! Finally, I just added the dots in the centres of the flowers using Nuvo Crystal Drops in Ebony Black - USA | UK. Since I started using the Nuvo Drops, no card is complete without them!